India in 1947 is a country in the grip of chaos - a country torn apart by internal strife. 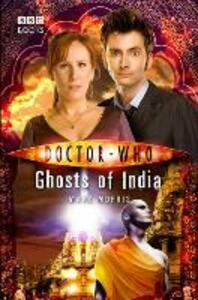 When the Doctor and Donna arrive in Calcutta, they are instantly swept up in violent events. Barely escaping with their lives, they discover that the city is rife with tales of 'half-made men', who roam the streets at night and steal people away. These creatures, it is said, are as white as salt and have only shadows where their eyes should be. With help from India's great spiritual leader, Mohandas 'Mahatma' Gandhi, the Doctor and Donna set out to investigate these rumours. What is the real truth behind the 'half-made men'? Why is Gandhi's role in history under threat? And has an ancient, all-powerful god of destruction really come back to wreak his vengeance upon the Earth? Featuring the Tenth Doctor and Donna as played by David Tennant and Catherine Tate in the hit Doctor Who series from BBC Television.